“UNLIMITED” in more ways than one. The Signature Visa®1 card from Signal Financial delivers. Cash back without all the obstacles. There are many cash back credit cards available, but many of them come with lots of fine print about annual maximums, categories, annual fees, and so on. Who has time to keep up with all of that? We cut out all the complexities and made it simple. With the Signature Visa you get 2% unlimited cash back on all purchases, every day. But we didn’t stop there, the Signature card also comes with 5% unlimited promotional cash back on home-related purchases3. That includes purchases from home improvement and repair contractors, hardware and lumber stores, or furniture and home décor stores. No limit on how much cash you get back. 0% intro APR4 on all purchases, cash advances, and new balance transfers for the first 6 months after card activation. After 6 months, the standard variable rate will apply. $0 intro fee5 on all new balance transfers and cash advances for the first 6 months after card activation. Lock or unlock your credit card with the Card Lock app. If you lose your wallet, or leave your card somewhere, now you can lock it until you find it again. Use Card Lock to set restrictions on transactions that can be done with your credit card by type, location, or amount. For instance, you can create a setting that will decline online transactions, or create a setting for your local geographic area as the only location your card can be used. Create alerts in Card Lock that will immediately notify you about activity on your card. Detect unauthorized transactions right away, and easily keep yourself up to date on your card activity. Get quarterly updates on your FICO® Score in the Visa Access Point site. The score we show is the same one we use to evaluate your credit when you apply for a loan. Once you’ve registered for Access Point, you can easily manage your card online and access your FICO® Score from your Signal Financial online banking account. To view your score, log into eBanking, click on the Credit Card tab, and then click on the FICO® Score button. Click here to learn more about how this free service works, how FICO® Scores are calculated, and how they are used. Get even more details at ficoscore.com/info. 1 Annual Percentage Rate (APR) for the Signature Visa credit card may vary and not all applicants will qualify for the lowest rate. The interest rate for purchases and cash advances is determined by the Prime Rate published in the Money Rates section of the Wall Street Journal. If the prime rate has changed on the last day of the quarter, your APR will change within the first fifteen (15) days of the next quarter. Minimum interest rate for the Signature Visa is 12.00%; maximum interest is 14.00%. Interest rates for the Signal Visa Signature consist of the Prime Rate + margin and depend on the member’s creditworthiness. Cash back benefits apply only to purchases made with the member’s Signature Visa credit card. Cash back is credited to the member’s credit card account at the end of each billing cycle. Member must be in good standing to receive cash back benefits. Cash back will be removed from the member’s account if the qualifying purchase is returned/refunded. Rates, benefits, and fees are subject to change at any time without notice. 2 Offer of 2% cash back is a standard feature of the Signature Visa credit card and applies to all valid purchases made with the Signature Visa credit card, subject to other restrictions. 3 Promotional 5% cash back offer available on new Signal Financial FCU Signature Visa credit cards for the 12 months after card activation. For existing cardholders, 5% cash back offer is available from April 8, 2019 to April 7, 2020. After 12 months, cash back returns to the standard cash back rate of 2% for all purchases. 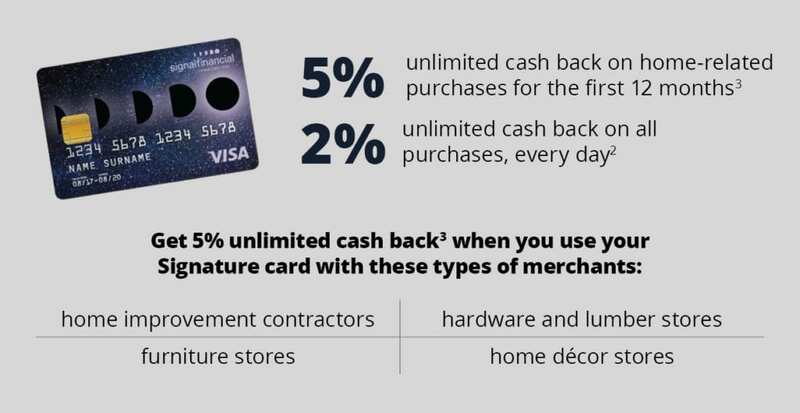 5% cash back will be credited to the member’s credit card account for purchases made at qualifying merchants in the categories of home improvement, home decor, and home repair. 4 APR=Annual Percentage Rate. 0% APR on all purchases, cash advances, and balance transfers for the first 6 months after card activation. Rate for any remaining purchase, transfer, or cash advance balance will revert to the standard variable rate, 12.00%–14.00% depending on creditworthiness, after the first 6 months. Rates and fees are subject to change at any time without notice. Refer to your most recent statement for your current standard variable rate. 5 No balance transfer fee or cash advance fee will be charged for the first 6 months after card activation. For any new balance transfers or cash advances initiated 6 months or more after card activation, a fee of $10 or 2.5% of the transfer/advance (whichever is greater) will apply. 6 APR=Annual Percentage Rate. 0% APR on all balance transfers and cash advances for the first 6 months after the transfer/advance. Rate for any remaining transferred/advanced balance will revert to the standard variable rate, 12.00%–14.00% depending on creditworthiness, after the first 6 months. Refer to your most recent statement for your current standard variable rate. For any new balance transfers or cash advances initiated 6 months or more after card activation, a fee of $10 or 2.5% of the transfer/advance (whichever is greater) will apply.